Most of the material here comes from their early period of seminal success and subsequent exploration spanning from 1984's War And Pain through 1991's Angel Rat. Two new songs from Infini, Global Warning and Treasure Chase, are in the set list also. Both are good choices for current Voivod. Yet, the better material is that culled from the earlier period. Voivod delivers old school thrash that's blistering on the Voivod and Ripping Headaches. They mix it with a bit of classic metal and prog on The Unknown Knows and another classic Tribal Convictions. These are likely my two favorite cuts here. On Panorama, and possibly Tornado, you can hear Voivoc channel punk through their thrash sounding like a schzoid Motorhead. Warriors of Ice wraps up with several bonus tracks. Notable is Nuclear War, a seminal thrash piece of the era from their 1984 debut War and Pain. Finally, Voivod closes the still in epic style with their cover of Pink Floyd's Astronomy Domine. Nice. Surprisingly, for a club setting, this live recording is crisp and clear (or made so by twiddling the knobs in post-production), and so every instrument receives its due. As mentioned earlier, taking their set list (heavily) from early material nears genius on their part and makes this a standout Voivod live collection. Recommended. 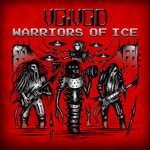 On Warriors of Ice, a crisp and enthusiastic live set, Voivod burns through some of their best progressive thrash material from those terrific early days.